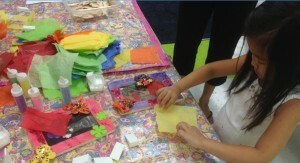 Play, Create, and More at The Crafting Hour with The Crafty Kids! Come to The Crafting Hour for a fantastic time with The Crafty Kids! Engage in our uniquely designed craft projects that are offered along with open play, snack time, and additional art activities for kids to freely explore while interacting with peers — all within in one hour! These originally-designed crafts are suitable for boys and girls ages 18 months to 5 years old accompanied by caregivers. Bring your children here for an invaluable experience and go home with high-quality crafts and long-lasting memories! Weekly themes covering topics like jungle animals, boats, spring, and more make The Crafting Hour experience fun and exciting from one class to the next! Open play stations include Thomas the Train Wooden Train Set, Little Tikes Kitchen Set, Melissa and Doug Dollhouse, and Duplo Legos! All of our staff are well-trained, friendly, and attentive instructors who love to engage with children! We remain open on school holidays too! Children 18 months to 5 years with caregivers welcome! Spend quality time with your child making special mementos of your time together! Children learn art techniques embedded in fun and simple craft projects. Only $15 per child. Advanced registration required. Every Tues & Thurs 11:00am-12:00pm and 1:00pm-2:00pm and Mon & Fri 10:00am-11:00am and 12:00pm-1:00pm. To register call 212-732-5182, email info@thecraftykids.com, sign up through Kidz Central Station, or use Paypal below.